Financing a tour en route. 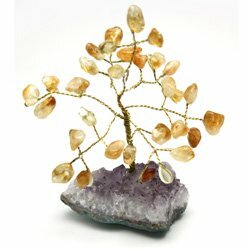 One of my hobbies is making gem trees from polished semi precious stones and gems, with either copper or silver wire. 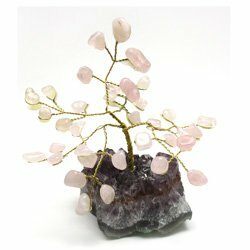 These pictures are not my creations, but they will give you an idea of the type of things/hobby/craft. They stand approximately 6" tall. I have the idea to take some materials with me to make some of these en route. I have enough materials for 40+ trees, the weight is minimal, and they take up the space of a 1ltr ice cream tub. Should I possibly try to sell them, or should I just give them as gifts to those that have shared food, water and/or accommodation with me at their expense. Bearing in mind that I can rustle up one of these trees now in about an hour from start to finish. Re: Financing a tour en route. It really depends on where you will be traveling. Your only chance to sell some would be in Western countries and I think it would be rather difficult and time-consuming. But having them to give as a gift to thank locals who offer you a meal, a roof, or a special moment is a great idea. I think it is a much more realistic option and a good one. That way you won't have to carry so much extra material and every tree you make will be really special. "Trust in Your Gear is Peace of Mind"